Secretary of State Mike Pompeo will deliver a major address Sunday aimed at pressuring the Islamist government in Tehran and supporting protests by the Iranian people against government corruption, the strongest internal unrest the regime has faced since 2009. While the speech will not directly advocate regime change, it will support the "legitimate demands of the Iranian people, especially their economic demands for a better life" as part of the U.S. policy of "maximum diplomatic pressure and isolation" of Tehran, a senior administration official said Thursday. The administration has invited several prominent members of the Iranian-American community to the gathering Sunday at the Ronald Reagan Presidential Library in Simi Valley, Calif., where Pompeo will deliver the speech titled Supporting Iranian Voices." Rep. Ed Royce (R., Calif.), who chairs the House Foreign Affairs Committee, and Sen. Tom Cotton (R., Ark.) also plan to attend. California is home to 250,000 Iranian-Americans, many of whom emigrated to the United States 40 years ago during the Islamic revolution. Pompeo plans to speak directly to these Iranian-Americans and tap into their desire for a better life for their relatives and friends who remain in their home country. He plans to survey the history of the Tehran's ruling regime, how it has stolen assets from its people to fund terrorism around the world, "its brutal oppression at home" and how it has used the country's "enormous wealth" to "line its own pockets," the official said. Pompeo also will highlight specific examples of corruption by regime elites and build on a promise in a May 22 speech to "advocate tirelessly for the Iranian people." 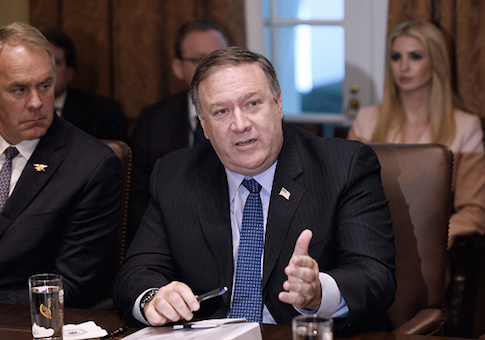 After President Trump dismantled the nuclear deal with Tehran forged during the Obama administration, Pompeo used the May speech to spell out 12 requirements for a new U.S. agreement with Tehran that would lift the economic sanctions and restore diplomatic and commercial ties with Iran. Critics have said the dozen demands are so broad and unrealistic that they would require regime change in Tehran. The administration, however, insists that's not its main goal. "Just because we're properly tallying the broad inventory of Iran's threats, its nuclear program, its terrorism in the region, its human rights abuses, and detention of foreigners arbitrarily, it's not a proxy for regime change," the official told reporters. "These are all basic requirements. We are seeking a change in Iran's behavior." Instead, the Trump administration's pressure campaign against Iranian leaders is designed to shed light on the amount of resources the government spends on terrorism and other destabilizing interventions in foreign wars when its own economy is crumbling. Iran has spent more than $16 billion supporting Syrian leader Bashar al-Assad, including a $4 billion line of credit, doles out $700 million a year to Lebanese Hezbollah, and has spent hundreds of millions more destabilizing Iraq and Yemen, the official said. Pompeo's speech comes on the heels of new reports detailing the trove of Iranian nuclear documents Israeli spies were able to steal, including explicit weapons-design information. The official said the "vast atomic archive" the Israelis obtained is authentic and equal to a half a ton of documents that Israeli and U.S. officials continue to study.